The MMCI Preservation Grant was established to encourage the preservation and documentation of Minneapolis-Moline and predecessor companies so historical information is not lost to future generations by the passing of time. The purpose is to especially encourage and educate the younger generation, but it is not limited by any age. 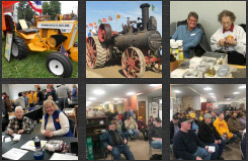 Examples of projects: Restoration of tractors, implements, oral histories, company history, displays, etc. The grant awards up to $1,000 for application proposals that meet the guidelines. Four preservation grants have been awarded since the project was initiated. Guidelines and an application form are available below. A new Oral Histories Grant expands this mission by encouraging production of oral and video interviews of persons with relevant, historical information of M-M companies and their products. To apply for the new Oral Histories Grant, which awards up to $250 for an interview, complete an application form (available at the bottom of this page). Meet Recipients of our MMCI Grants here. For questions concerning the applications, contact the Director listed as Preservation Chair.